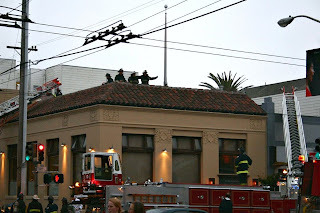 Text messages started flying late Saturday afternoon (November 22, 2008) after Divisadero residents noticed multiple fire trucks assembled outside of the ultra-popular Western Addition restaurant and bar. A Nopa regular (who swears by the pork chop) tells me he heard the damage is minimal, although he noted, "The crazy thing is that apparently, they have a box of tissues placed precariously next to a candle by the sinks." He continued, "Friday on my way to the bathroom I saw a woman stomping out tissues that had caught fire while she was washing her hands." Obvi, that little mid-dinner incident Friday didn't cause Saturday's conflagration, but it's unnerving, I'm sure, for the management. Anyone have more news on the Nopa fire? Comment if you know anything, and I'll update if I find any new info. So far, all I've gathered is that the restaurant's voicemail and website note that they will be closed for the Thanksgiving holiday from November 23 to Friday, Nov. 28 at 5pm. Love that place. 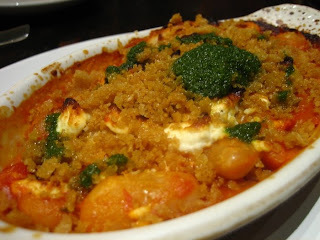 Was just in there recently for a quick meal at the bar, and my favorite starter is still on the menu: a piping hot little ovoid dish filled with wood oven baked giant white beans, chunky tomato sauce and oregano with feta and breadcrumbs gratineed on top. Holy Lord is it good. Here's hoping that there wasn't significant damage at this neighborhood hotspot, and hopeful wishes that they're back on track soon! I vote for the Goat Cheese Crostini appetizer. Mmm mmm mmm..
i drove by last night and it looked like they were open! hopefully there wasn't too much damage.